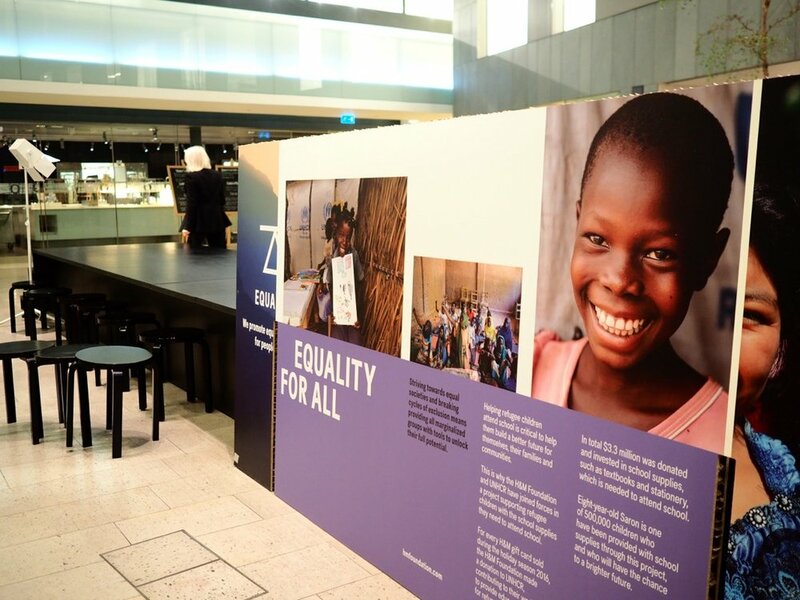 Alongside collaborator Observatory, and Produktionshuset DreamQuest, we designed and produced two indoor exhibitions, raising awareness for H&M Foundation to their fellow co-workers at H&M Headquarters. Through partnerships with experienced organisations around the globe, the H&M Foundation works both on a global scale, creating systemic change with transformative programs, as well as in local projects to directly address urgent needs. Our brief was to create a travelling exhibition showcasing H&M Foundation. The first Exhibition was produced for the H&M Headquarters in Stockholm City. The second exhibition was installed at H&M Marievik, the other HQ in Stockholm. Are you an individual or a brand in need for exhibition design and production? If you enjoyed this case study, have a look at Noori Tales: Stories from the Indus Delta too – another photography eexhibition series we designed and produced. For more information, send me an email and I will tell you all about this event, or chat to you about yours!